The Farmer's Market is full of goods, including some wonderful cash jackpots. Click here to play! Never mind the fruit, vegetables, and other produce, just get down to this wonderful slot and start playing for your winnings today! 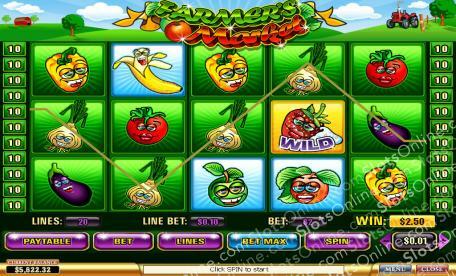 Farmer's Market is an exciting 5-reel slot that is played across 20 unique pay lines, with the more lines activated allowing for more winning combinations. The Strawberry is Wild and can become any other symbol in order to finish off combos, as well as paying out up to 5000 times your initial wager. There are two Scatters, with the Watermelon paying out up to 100 coins, and the Grapes appearing on reels 1 and 5. Additionally, the Grapes are Bonuses, and when they appear on the reels you will be sent to the Bonus Round. Enjoy the sights, sounds, and smells of the fresh produce markets at Farmer's Market, and return home with all of the day's winnings! The Watermelon is Scattered and can show up anywhere on the reels. If you manage three or more you will also receive a payout of up to 100 times your bet. The Strawberry is Wild and will become any other symbol in order to complete winning combinations. Spin up all five on an active pay line to receive 5000 coins. The Grapes is the Bonus symbol and whenever they appear on reels 1 and 5 you will be sent to the lucrative Bonus Round.